The Ashbrooke is truly an elegant inn in the heart of Egg Harbor Wi, in the French Country motif. Fred and Debi Anderson, the owners and innkeepers, have done a wonderful job in creating a warm and friendly atmosphere at the inn. Truly great Door County lodging! And in our many visits and revisits to the inn, we must say that they keep this place looking brand new. We just retoured the inn with Fred, and chatted about the inn. Lots of work being done now on upgrading the bathrooms. They never stop improving this wonderful place! See its charming beauty in the video above. 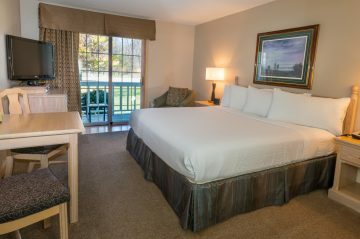 The hotel has been named one of the first inns in Door County to be "Travel Green Certified." 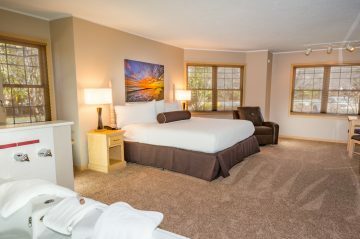 The hotel offers free wireless internet access, and each room or suite also includes satellite TV, individually controlled air conditioning and heating, coffeemaker, hair dryer, iron and ironing board, fridge, microwave and wet bar. There is also a DVD player, bathtub and shower, and an iHome audio player. The whirlpool suites also include robes for use during your stay and a clock radio with a CD player. The property is beautiful, full of greenery and flowers, and is meticulously cared for. In 2010, The Ashbrooke also added a gazebo for your outdoor enjoyment, tucked away amidst the grass and trees. 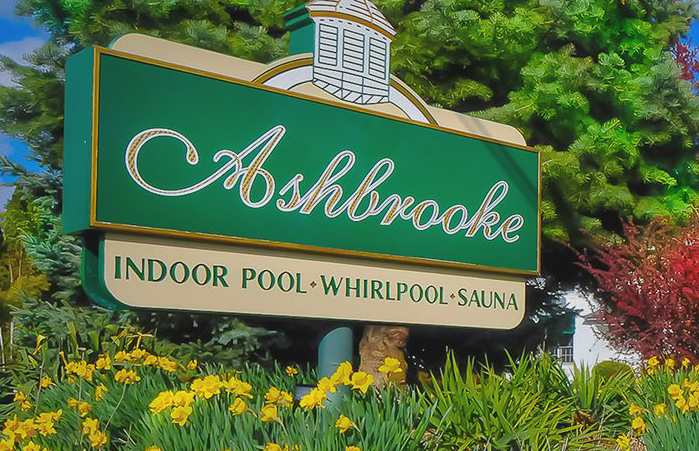 There's lots more to The Ashbrooke too, including an indoor pool and hot tub, dry-heat sauna, a fitness room and a huge outdoor sundeck. The hosts also provide coffee, muffins and rolls each morning in the lobby, where you can also pick up a complimentary copy of the Wall Street Journal, or a USA Today. A complimentary DVD library is there for your use during your stay, as well as machine, fax machine and more. The Ashbrooke offers 36 beautiful rooms, and is an adults-only hotel. Of the 36, 10 are suites with a living room and separate bedroom; 4 of those suites also have a whirlpool, while 16 total rooms of the 36 have whirlpools. Most of the rooms are done in neutral or rose-tones, with a variety of bed quilts and sophisticated window treatments. When you walk into a room, you feel the impact of how well the rooms are decorated and how well they present a complete and consistent décor. We know people who stay here every time they come to Door County, and they just love it! We were impressed with the details and well-appointed rooms, which truly do make the hotel's “Romantic Elegance” claim absolutely true. You walk in and love the room immediately. On this latest tour we took a look at Room # 116, and Suite #101. Both were up to The Ashbrooke's normal standard: gorgeous! 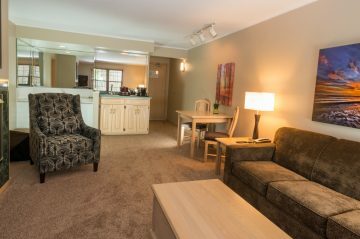 The suites have a gas fireplace, sleeper sofa, nice living room, wing back chairs and more. All the rooms have king beds, and Fred tells us that the mattresses are being converted to the "Dream Bed" which is just a fabulous mattress that is very plush, and guests who have experienced it absolutely love it! This hotel keeps getting better and better. 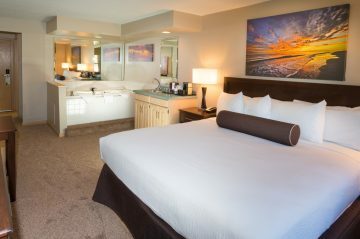 There are several rooms to choose from, like The Ashley, The Getaway Room with great wicker furniture (all the first floor Getaway Rooms have a whirlpool), The Signature Room with four-poster king beds and a double whirlpool, or The Grande Suite which offers 540 square feet of romantic elegance. You can view each room type online on The Ashbrooke's website, and rates range from about $129 - $339 depending on room type and season. This is an adults-only hotel, no pets, and is smoke free throughout the property. The Ashbrooke is one of the gems in Door County lodging. It is conveniently located near some of the best golfing in the County, just about next door to a great breakfast restaurant, and walking distance to the entire downtown of Egg Harbor. Check their "promotions" page too. So check out their website, but certainly give The Ashbrooke a try on your next visit - you will love it - and please tell them that DoorCountyNavigator.com sent you! Your help keeps our website alive and well!